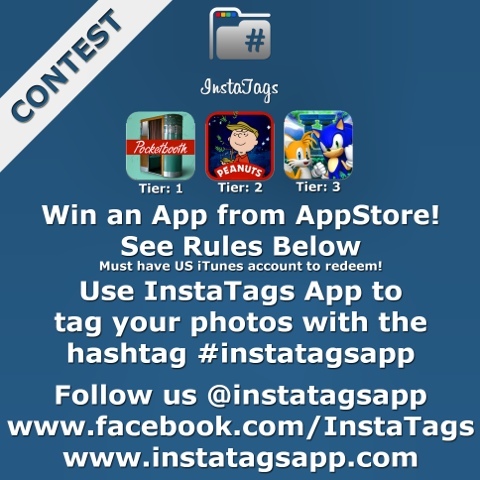 Using our FREE APP "InstaTags - Hashtag Manager" tag your photos with the hashtag #instatagsapp on Instagram. We will pick 4 photos on 12-20-2012 midnight EST and repost them. The reposted photo with the most likes after 24h will WIN. The winner will receive one of the following App from the AppStore. 2. A Charlie Brown Christmas by Loud Crow Interactive Inc. The App will be determined based on the number of likes received on the reposted photo per the below tiers. The winner will be notified via Instagram. Must have U.S. iTunes account to redeem. Entries are accepted until 12-20-2012 midnight EST. Congratulations to the Selected Candidates for the Win an Amazon.com Gift Card Contest!!! Congratulations to @amandagroz, @gurukan, @ichdarz and @alby_semmi our selected candidates for the Win an Amazon.com Gift Card Contest!!! Please vote for your favorite photo by liking the reposted photos. The winner will receive an Amazon gift card. The gift card value will be determined based on the number of likes received on the reposted photo per the below tiers. The winner will be notified via Instagram. Tier 1: 0-25 Likes receives $1.00 Gift Card Value. Tier 2: 25-50 Likes receives $2.00 Gift Card Value. Tier 3: 50-75 Likes receives $3.00 Gift Card Value. Tier 4: 75-100 Likes receives $4.00 Gift Card Value. Tier 5: 100+ Likes receives $5.00 Gift Card Value. Follow us for upcoming contests. Thank you for your support! Contest - Win an Amazon.com Gift Card! We will pick 4 photos on 12-07-2012 midnight EST and repost them. The reposted photo with the most likes after 24h will WIN. Entries are accepted until 12-07-2012 midnight EST. Congratulations to @ulricaloeb, @fedy7, @niemamnietu and @m3ter our selected candidates for the Win Free App Contest!!! The candidate's reposted photo with the most likes at 12/1/12 midnight EST will win. Follow us for upcoming contests. 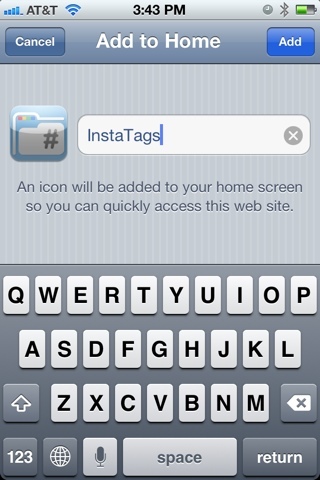 InstaTags App: for organizing and managing hash tags to use on Instagram™ photos. Get more likes and follows with the most relevant #tags. First and fore­most, tags are descriptive. They can also aid sig­nif­icant­ly in con­tent dis­cov­ery, allow­ing users to gain more expo­sure for the images they pub­lish using the wild­ly pop­u­lar mobile photo-sharing app, Instagram™. Tag­ging pho­tos with the right terms at the right time can lead to a flood of likes and new follower. 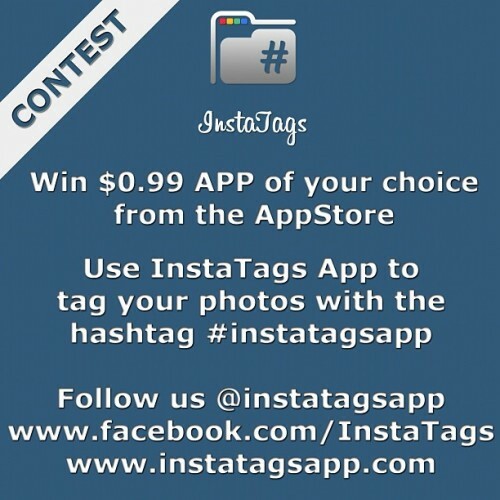 InstaTags App is here to help you achieve all that and more. 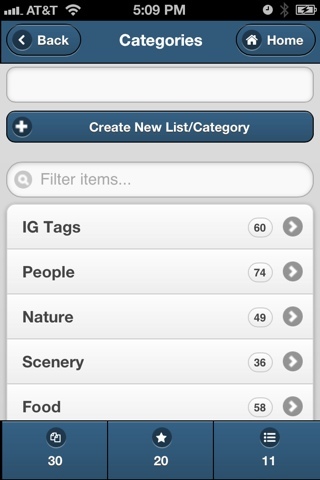 Add tags to and from built-in categories and lists. Add selected tags to your own lists to use over and over. Select tags based on your current location. View the 100 top most used tags. Find and discover photos with specific tag. Even view all tags used by the photo, to save for later use in your list or clipboard. Find new or similar tags. Copy and collect your tags you plan to use for on an Instagram photo and export it directly into Instagram app. (Note: Instagram v2.0+ is required) Your tags are also available in iOS clipboard at export or copy from any list or category. Please be aware there is a tag limit of 30 per post imposed by Instagram™. Don't over tag your photos. Jump into Top 100 tags. 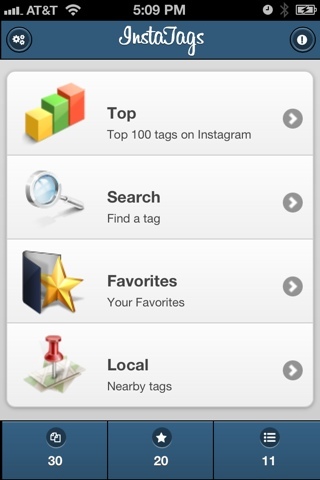 Search any tag through out Instagram. 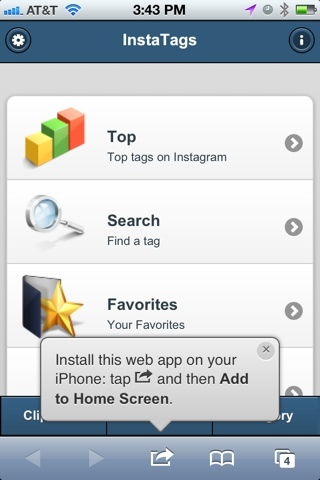 View Photos associated with the tag selected right from the app. View other tags used by the photo by hitting the tags icon. View the photo on Instagram App by simply taping the image. or even add to your own list or categories. Create new list or categories. Use built-in lists, modify them to your hearts desire. 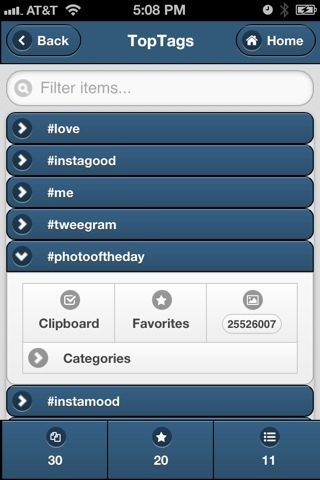 InsaTags Web App: for organizing and managing hashtags to use on Instagram photos. Get more likes and follows with the most relevant #tags. 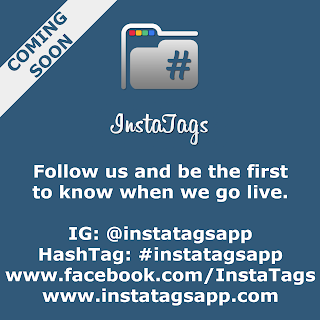 Follow us and be the first to know when we go live. Instatagsapp is the quickest and easiest way to tag your Instagram photos with the most popular and/or relevant #tags, so you get more likes and more follows. First and fore­most, tags are descrip­tive. They can also aid sig­nif­i­cant­ly in con­tent dis­cov­ery, allow­ing users to gain more expo­sure for the images they pub­lish using the wild­ly pop­u­lar mobile photo-sharing app. Tag­ging pho­tos with the right terms at the right time can lead to a flood of likes and new fol­low­ers. Hashtags are words or phrases prefixed with the symbol # a form of metadata tag. Used in messages on microblogging social networking services such as Twitter. You can use hash tags to revitalize old photos that didn't get the attention they deserved or comment on other photo with your choice of tag. 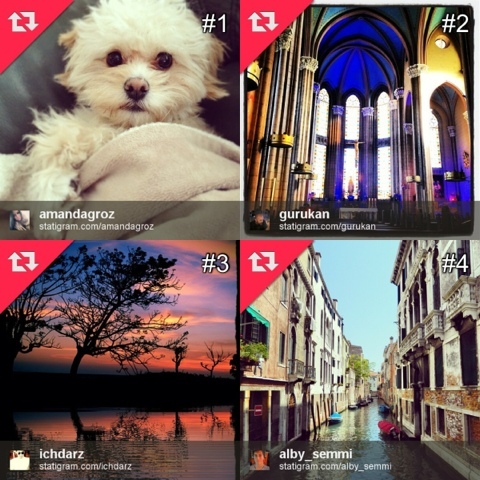 Using the top Instagram Tags insures that your photo will be view-able by many who subscribe or monitor those tags. 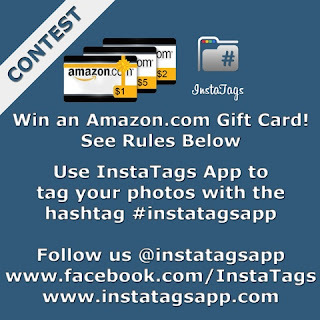 Just paste key words with the hashtag (#) prefixed in the comment section of your photo. 1. 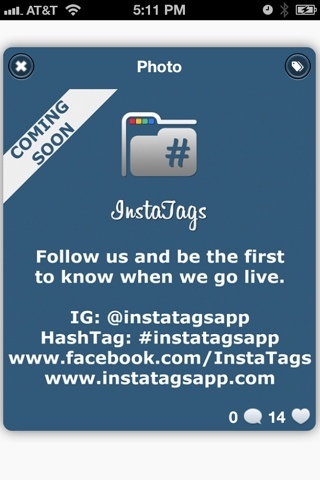 Browse to our website www.instatagsapp.com with your mobile device. 2. Hit the action icon from on safari. Enjoy full screen experience as if it were a native iOS App. Stay tuned for the official iOS app. There are many Soical Outlets these days; Facebook, Twitter, Tumblr, Pinterest, Instagram, Youtube, Google+. We are working to cross-post to all major networking sites from this blog. The Web App will be available to use via mobile device. Once the functionality is finalized we will be porting the code to iOS App. Using PhoneGap framework this should be fairly strait forward. I will be posting a guide, on how to add our Web App to your iOS device from our mobile site, shortly. 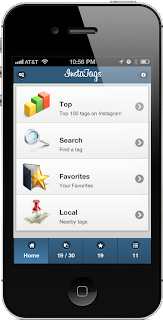 InsaTags WebApp is for those who would like to organized and manage hash tags from instagram. This WebApp also can be used for other social networks as long as it is using hashtags for tagging content. Twitter, Tubmlr, Pintrest all use # tag to metadata the content. Working on different concepts of the App Icon. To embody organization and management as well as clean modern style look and feel. The following concepts are currently in the works, a folder with hashtag symbol with a instagram color scheme tab, a binder with instagram color scheme as the tabs and a hashtag symbol within, a 3d cube with depiction of social networking logos on each face of the cube, a luggage tag with the instagram color scheem and a hashtag symbol within.